According to a New York Times report, 73 people have suffered harm, including fatal injuries, from carbon monoxide poisoning after failing to turn off the ignition of their keyless vehicles. 28 people have died and 45 others have suffered injuries since 2006. The fatalities were a result of drivers leaving keyless vehicles running in enclosed or attached garages. The New York Times derived its data from news reports, lawsuits, as well as police and fire records. Keyless authorization or ignition systems use a key fob, or key ring, to start the car by pressing a button linked to the key fob. 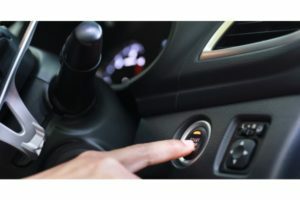 The car will not start if it does not detect the key fob’s signal and, once started, it continues to run even if the device is removed from the vehicle, i.e., the driver exits the vehicle. Carbon monoxide is an odorless and colorless gas that often kills people while they are sleeping. For those lucky to survive prolonged exposure, permanent brain injuries, disabilities, and other impairments are likely to result. If a vehicle’s engine is silent, a driver simply may not notice that the vehicle is running when leaving the car. While most people can easily keep track of whether a car is running, mistakes do happen. If the vehicle is stored in an enclosed garage attached to a personal residence, the potential for tragedy is present since carbon monoxide may easily leak into an area regularly inhabited by the home’s residents. Hybrids pose a significant risk since these types of vehicles may restart after a driver leaves the vehicle. A hybrid car’s engine may not be running when a driver exits the vehicle, but it may automatically start later when power diminishes and reaches a low level. Automakers have been aware of this problem for years but have apparently done little to address it. The Society of Automotive Engineers (SAE) published safety recommendations in 2011. “Our standards are voluntary. It is up to the manufacturers to use them where required,” said the director of SAE, Jack Pokrzywa. It is noteworthy that no central agency tracks these types of fatalities, thus there may be even more deaths caused by carbon monoxide generated by a running motor vehicle. One way to prevent carbon monoxide poisoning is to install carbon monoxide detectors in both the home and garage. Automakers may be liable for injuries or deaths caused by defects in the automobiles that they manufacture. If you or a loved one has suffered any type of injury resulting from any type of accident, contact Powell Law at (570) 961-0777 or visit us online. The attorneys and staff of Powell Law carry on the work of a law firm that spans generations and has represented thousands of Pennsylvanians over a period of 112 years. The consultation is free and you don’t pay any fees unless we win your case!